Over the past few years, a number of structural economic changes-a persistent bout of historically low interest rates, the polarization of growth between developed countries and emerging economies, and global deleveraging-have affected how Investment Advisors (IAs) deploy client capital. The “metabolic rate” of the economy is also accelerating as industry dynamics evolve faster than ever and profit pools shift across value chains in many industries, thanks to unprecedented technological innovations. Life-changing developments such as driverless cars are years, not decades, away. The short-term focus of quarterly benchmarking works against IAs. One of their great advantages, in our opinion, is their long-term investment horizon. A zealous focus on the benchmark means investors can miss chances to capture mispriced assets. They can also miss out on the liquidity premium, which they collect by buying illiquid long-term assets at a discount. Relative-investment frameworks can lead to an undesirable exposure to certain risks. The very nature of the strategic asset-allocation process investors have used to select benchmarks also holds those investors back. Strategic asset allocation is backward-looking and fails to incorporate emerging trends (themes) and forward-looking perspectives on the economy. Many Registered Investment Advisors, like WT Wealth Management, are turning to “thematic” investment strategies for portions of our clients' assets when we construct portfolios. That was one of the most intriguing insights we gleaned from a series of interviews we conducted with about a dozen institutional investors, including investors in pension and sovereign-wealth funds. Broadly speaking, thematic-investment approaches seek to capture, across asset classes and around the world, the opportunities created by long-term structural trends and the medium-term cyclicality often associated with these trends. Some managers, like WT Wealth Management, have deployed thematic strategies for years. We appreciate the way this enables us to actively manage risk and to ensure deployment of client capital against the opportunities that best reflect our clients' investment objectives and personal risk tolerance. However, many institutions have not yet taken advantage of such approaches. In this white paper, we outline the process by which we develop and execute thematic-investing strategies in our client accounts. Thematic investing requires a fundamental understanding of the impacts of long-term economic, political and social trends on regions and sectors-and such an understanding reveals investable opportunities. Thematic managers develop proprietary views on how the second- and third-order effects of structural trends will create hot-spots or discontinuities in certain sectors and regions in which value and risk will be concentrated. This is a big departure from relative, traditional strategies. Exhibit 1 illustrates some of the differences. Exhibit 1: Relative and thematic frameworks differ in several dimensions. Such an approach allows managers to generate alpha, at scale, by focusing on investment opportunities in hot-spots where capital can be deployed. The more systematic investment process and in-depth research required for thematic investing builds a deeper understanding of the underlying drivers of value creation and risk. Managers can use this knowledge not just in thematic investing but also in other strategies. 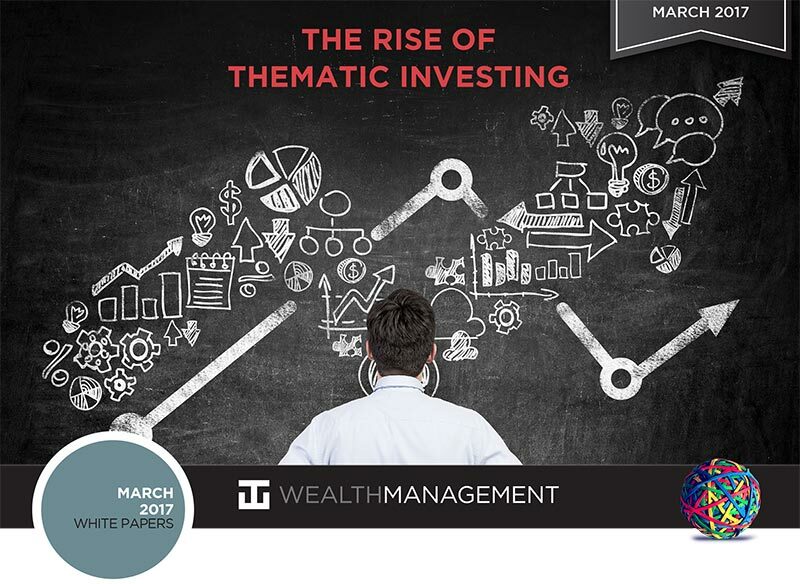 The thematic-investing approach gives managers a dynamic, flexible way to validate and express their hunches by applying a forward-looking lens to investment decisions. Managers have long been aware of thematic investing, but many have thought it too complex to implement because of restrictive portfolio structures, risk limits, and the challenge of putting in place the capabilities and processes needed to develop truly distinctive investment insights. In recent years, however, a number of managers have taken tactical and creative approaches to implement some form of thematic investing, usually as an addition to their overall investment frameworks. Exhibit 2 illustrates four of these approaches. 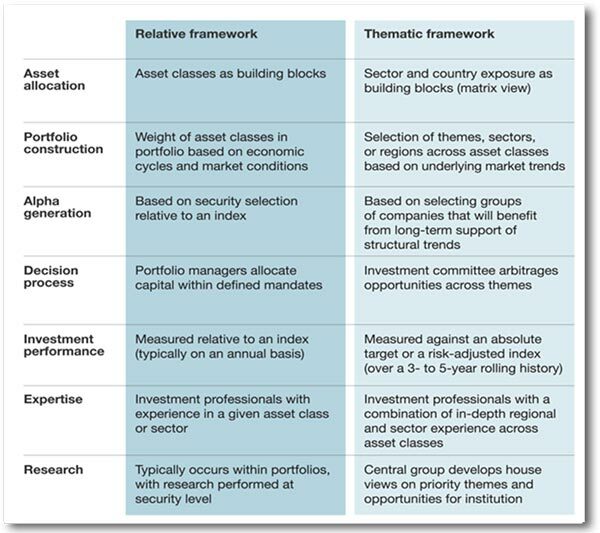 Exhibit 2: Institutions are using a range of approaches to develop thematic-investing strategies. 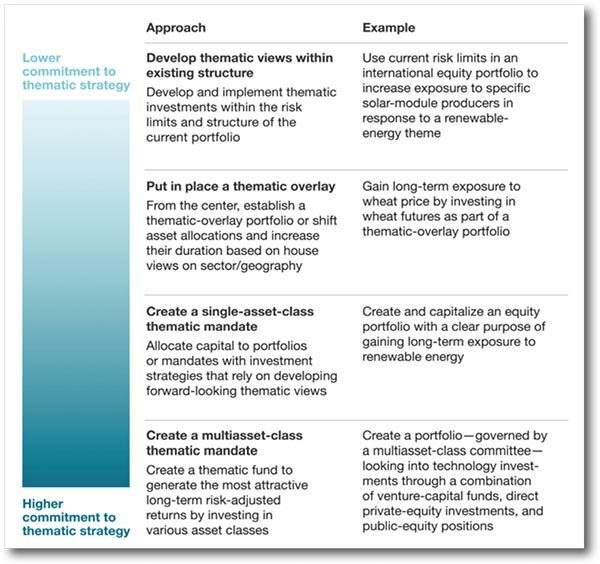 The systematic change to fold a thematic strategy into a relative-investing framework is good news for investors, as many managers have held back because they did not wish to completely overhaul their approach or their portfolio. But thematic investing still requires the right research capabilities and a disciplined investment process. WT Wealth Management has dedicated substantial resources to developing our thematic approach to investing and the subsequent strategy. A structured, rigorous approach to thematic investing is required, not only to identify investable themes, but also to prioritize them. The following five-step approach does both, and has been implemented by a number of leading thematic investors. Is the trend really structural, or is it conjectural or short term in nature? Does it have material implications for the evolution of certain sectors or regions? Does the institution have the ability to generate distinctive insights about that specific trend and identify sufficient investment opportunities? Are research and investment professionals excited about the trend and willing to invest time looking into it? At this stage, managers should also develop a robust view of the institution's explicit and implicit exposure to the selected trends before adding more long-term risk to the portfolio. For instance, an Australian manager may not own shares in companies serving China's rising middle class, yet a commodity-filled Australian equity benchmark can significantly expose that same investor to a slowdown in Chinese consumerism. In a nutshell, managers must ensure that they understand their true exposure-both direct and indirect-to these trends before conducting additional analyses and seeking greater exposure. Once key trends have been selected, managers must trace them through to the themes they produce- typically the implications for a region or sector of interest. With the increased developments in driverless cars and drone technology, literally dozens of companies could benefit from this widespread implantation into American and world society. In our experience, the most attractive opportunities are found when multiple themes converge and reinforce one another in a specific region or sector and when themes are expressed as discontinuities and divergences from common knowledge. The identification of relevant themes depends on a manager's ability to rapidly identify a trend's impacts on revenues and profit pools in affected subsectors. Making sense of vast amounts of information and identifying new economic patterns is difficult. Most successful managers use external experts as thought partners and sounding boards to supplement their internal knowledge. Our experience also suggests that managers who can rapidly move from interesting trends to themes before trying to identify specific investment opportunities move faster, get more impact from their research investments, and develop more detailed insights. Prioritizing themes is even more challenging, as managers must make decisions based on imperfect information and diverging points of view within the institution. The process can be time-consuming and frustrating without the right approach but rapid and effective if appropriately designed. Are there companies whose businesses are heavily exposed to the theme? Are there other assets that might do well if the theme materializes? Can potential investments be made without running excessive risk? Themes should be debated and prioritized by representatives from the investment, research and risk teams to ensure both the soundness of the thinking and the alignment of the theme with the overall corporate perspective. This will prevent thematic portfolios from becoming vehicles for individuals to place large bets based on their personal biases. Managers develop an understanding of the value chains associated with a given theme, including the key players, industry dynamics, and performance drivers. They develop a perspective on how industry dynamics will be altered by the theme, forcing players to adapt and creating winners and losers. To be successful at this stage, managers must first ensure that their thesis is clear, grounded in objective facts, and based on themes that have a high degree of probability of materializing. They must find insights into business systems beyond those most directly affected by the theme. For example, an investor looking into the impact on the transportation sector of populations migrating to suburbs from large city centers may determine that the best investment opportunity will be in the manufacturers of batteries that will power light trains rather than in the transportation companies themselves or in the related infrastructure. Finally, depending on the size of the portfolio and the number of investments it includes, additional consideration might be given to the level of correlation of the various assets, as well as the key sensitivities of specific thematic risk factors. Thematic investing provides an alternative to traditional strategies-one that leverages the greatest strengths of institutional investors while providing the opportunity to develop proprietary knowledge and informed opinions. By understanding implicit sector exposures and then determining where and how to invest based on well-researched and debated themes, institutions increase their chances of delivering superior returns over time in an increasingly complex investment landscape. No portfolio should be constructed without a sound base. The core portion of client portfolios, comprising exchangetraded funds (ETFs) allows clients to participate in rising markets while out-performing in declining ones. Depending on portfolio size, individual equities are our best picks. Companies in this group need to be culturally significant and dominant within their industry, and they need to have large barriers to entries and wide moats to keep new players out. If we have gotten to the point where the company is so entrenched in consumer culture, we like it. It could be Adobe, Amazon, Facebook, FedEx, Google, MasterCard, Starbucks, UPS, and Visa, among others. virtual reality, 3D printer technology, cyber technology, electronic payment systems, or maybe even cloud technology. This triad of different and unique strategies within one portfolio is what makes WT Wealth Management different from other financial services firms. Having three unique strategies within one portfolio delivers little overlap and expedites the selection process, and the strategies complement each other in constructing a well-rounded, fully diversified portfolio- which is always our goal at WT Wealth Management.